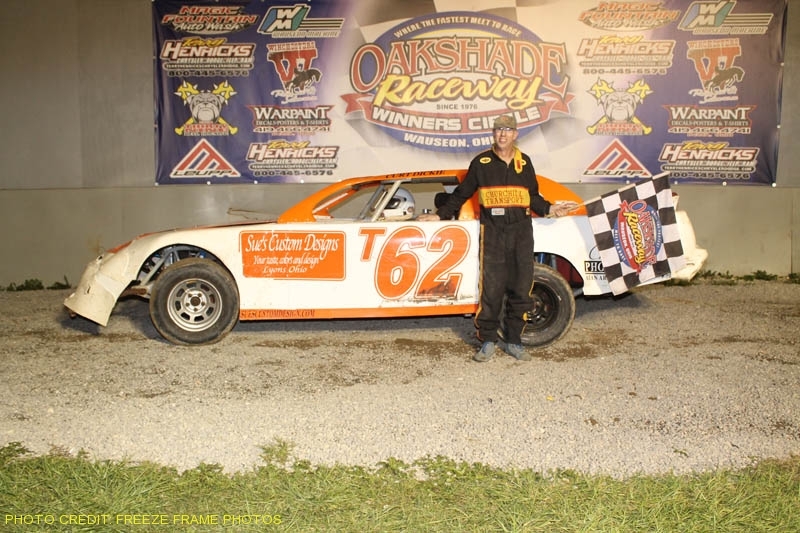 Brian Ruhlman picked up his first feature win in eight years at Oakshade Raceway Saturday night. With another large car count, the late model feature was once again a tough race to get a starting position in with nearly twice as many cars having to pack things up and watch the feature from the stands as the number of cars actually starting the feature. Max Stough’s effort to make the feature was thwarted in the second late model consolation after his car rolled over a couple times in an incident at the end of the front stretch. Stough was not hurt. Bruce Stuart took advantage of starting from the pole in the 25-lap late model feature and opened up a big lead early on. Brian Ruhlman closed in on the leader and on lap eight, made a move to the inside of Stuart to take the lead. Stuart had more problems four laps later when he came off turn four too high and made contact with the front stretch wall. Stuart then faded back through the field. Last week’s feature winner, Kris Patterson, worked his way up to second midway through the race, but Ruhlman had opened up a huge lead over the rest of the field. A caution for Brian McCabe on lap 17 eliminated Ruhlman’s large lead, but Patterson couldn’t keep up with Ruhlman after the green flag flew once again. Ruhlman made it a clean sweep on the night, winning his heat and making it look easy in his win in the late model feature. It was his first feature win in eight years at Oakshade Raceway and only his second ever. His first victory came the first night he raced at Oakshade. Patterson couldn’t make it two wins in a row and settled for second ahead of Justin Paxton, Rusty Schlenk (who started in the last row) and Matt Miller. The sportsman feature proved to be the most exciting of the night with a last lap pass deciding the winner. Jason Smith led the first five laps until he got too sideways coming off turn four and then fell back a few positions. He ended up spinning and bringing out the yellow a couple laps later. Dale Cole’s car slowed on the back stretch shortly after the restart and Tim Bernard slammed into the back of him bringing out the red flag for Cole’s broken fuel cell and ending both drivers nights. Last week’s sportsman feature winner, Ray Klawitter, took the lead shortly after the next restart and then a great battle between Klawitter, Tim Fisher and Jeremy Grover ensued. The three drivers battled three-wide at times and kept exchanging the lead among the three of them. That battle continued for a few laps until the 15 of Klawitter spun in turn four and brought out the caution flag. That left the race for the lead to be between Grover and Fisher. The two drove the last four laps door to door with Fisher the leader as they took the white flag. Fisher had the advantage much of the final lap, but Grover got a great run coming off turn four and won the drag race to the checkered flag. Mike Jessen managed a third place finish behind Fisher with Joe Derbeck and Chris Keller rounding out the top five. The bomber A Main was marred with caution flags, the first of which came out for Jake Rendel after he spun on the first lap after starting on the front row. Jim Scout took the lead from Matt Shipley on lap three and began to pull away. A few cautions later, Jake Rendel had worked his way back up through the field to second behind Scout under a late caution that set up a two-lap shootout to the finish. Rendel made one final attempt to challenge Scout on the last lap, but Scout was too strong and held on to pick up the win. Rendel finished second followed by Bill Toedter and Dan Bleikamp. Rob Anderzack, last week’s bomber B Main winner, was taken out early after coming to a stop between turns one and two and Gary Cole Jr. slammed into him on lap two. Josh Steinacker took the lead from Jared Rendel early and with the exception of a close call putting Roger Davenport a lap down, went on to the easy bomber B Main win. Jared Rendel held on to second and Kyle Light finished third. Eric Potridge, Hillary Majewski and Monroe McCoy got stacked up on the backstretch on lap five of the bomber C Main on lap five. Dennis Laney assumed the lead from the start and held off Bob Zuver and Jeff Foks Jr. to win the bomber C Main. More great UMP Late Model, sportsman and bomber racing continues Saturday, May 22 at Oakshade Raceway.